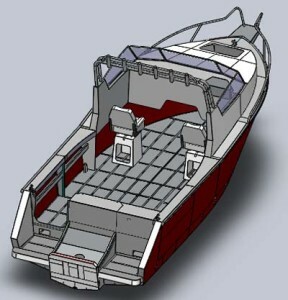 This is a fantastic boat designed for the serious fisherman/diver. It has a strong sharp bow entry, flattening out to a 14 degree dead rise. So it skims off the surface and then cuts through waves & chop very well. It is designed with a 4mm bottom, 4mm sides & gunwale,It has 5 stringers, which makes the panel spaces smaller, so the fisherman who wants to go fishing or diving. can handle just about anything. The floor is checker plate, (that can be carpeted if you wish). The transom has been designed for an after market live bait tank and burley muncher.This boat comes standard with in floor kill tank and a 175 litre fuel tank. 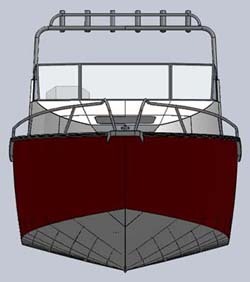 This boat is in a new format,it has formed full frames through-out the boat. It has been designed with many more fold parts, so consideraly reduced amount welding and build time. The deck will come pre-cut and there are many more ne improved methods in constructions. 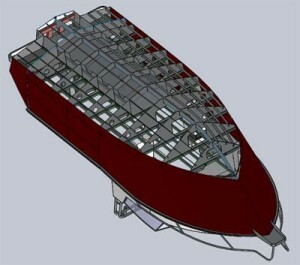 If you would like a Baillon’s Dart and don’t feel confident of building it, one of our licensed agents will manufacture this boat for you. For more information or a list of materials in the flat pack, Feel free to contact us.